A tool palette is a stationary collection of tools from where you can pick up a tool to apply somewhere in the workspace. All tool palettes are accessible in the index under the Tool box entry. Drag a tool palette onto the workspace to open it. You can place several tool palettes in the same binder to keep the tools you need together and save screen space. 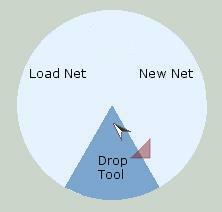 It is not possible to place tool palettes in the same binders as net pages or declarations, or vice versa. Select the tool you wish to apply by clicking on it with the left button of either input device. The tool cell highlights to show which tool is selected. The cursor also changes to indicate that you have a tool in the hand. Now you can apply the tool with the left button. 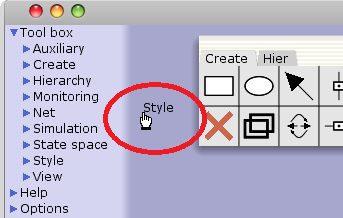 Note that the cursor is dimmed when the mouse is over an object where the tool cannot be applied. The tool stays in the hand until you drop it, either by accessing the workspace marking menu and selecting the Drop Tool entry, by clicking on the cell where you picked up the tool, by pressing the escape key (Esc) on the keyboard, or by picking up another tool. While a tool is in the hand, it is still possible to move objects around; this is done with a long click, where you press down the left button on an object and hold it down, until the cursor changes to indicate that the move tool is now active. When you have moved the object, release the mouse button. The tool that was in the hand before the move is back, indicated by a switch back to the associated tool cursor. 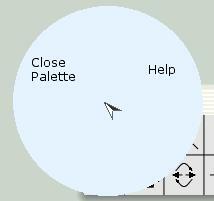 To close a palette, apply the Close Page tool from the Palette Tab Marking Menu to the tab for the palette. Read about the tool options that can be changed on the Tool box page. Brief tool tips are available for each tool in the palettes. To see a tool tip, move the cursor over a tool in a palette. The tool tip will be shown in a speech bubble after a brief delay.